Although the weather during the past three weeks or so has been very upredictable, with four seasons in one day on some occassions, we have just experienced 8 days of fine and sunny weather. This has allowed us to progress well with the new fieldwork season at the site, including the completion of our extended geophysical survey. David Hodgson and Susan Moore from Inverness, and Sarah Ward from Southampton completed the survey over a 6 day period, which included a real mix of weather conditions including thunder, lightning and hail showers! However, the sun provided some welcome respite between these extreme conditions and assisted the survey. 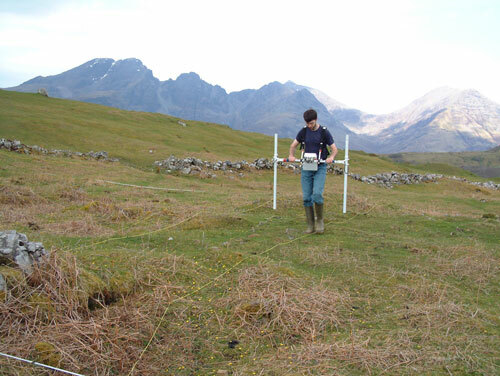 An area of ground totalling 0.54 hectares was subjected to survey including the Fluxgate Gradiometer survey at 0.5 metre resolution and Geoscan Earth Resistance Meter at 1 metre and 0.5 metre resolution. The team also conducted a ‘pseudo-section’ survey using the Geoscan RM15 and MPX15 Multiplexor, using Wenner and Double Dipole arrays. The 30 metres long section was run through the centre of the ‘roundhouse-type’ structure within the core of the High Pasture’s site, which from excavations within the entrance of the structure during 2005 indicated that it may have been built into the top layers of deep archaeological deposits. It is hoped that the vertical electrical profile through this area of the site will provide data pertaining to the depth of deposits and the possible structures they contain, which will inform our forthcoming excavations of this structure. 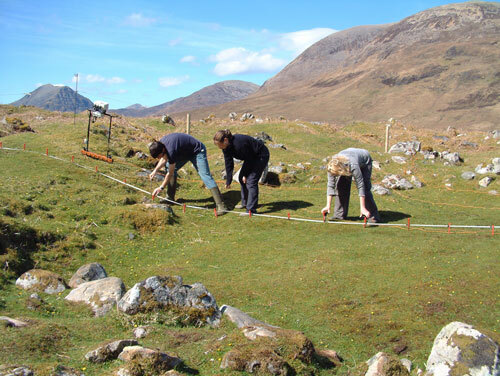 The data resulting from the geophysical survey is now being processed and we eagerly await the final report. 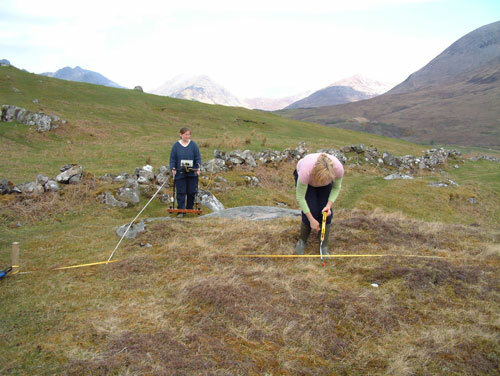 Fieldwork at the High Pasture’s site during 2006 and 2007 will investigate anomalies highlighted through the survey, using trial excavation techniques. In particular, we are interested in the potential identification of areas within the site that may have been utilised for metalworking. Excavations undertaken to date have revealed material relating to metalworking processes including vitrified crucible fragments, slag deposits, fragments of smelting hearths and hammer scale. Finally, we must extend a big thank you to the geophysics team, not just for the wonderful survey they have carried out, but also for the discovery of a cup-marked stone within the core of the High Pasture’s site. 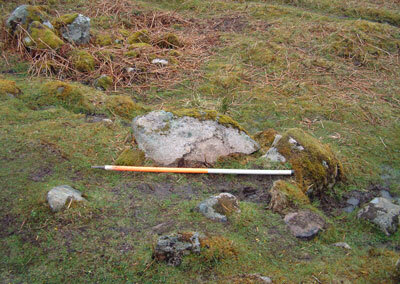 During a run through the site (to the north of the ‘roundhouse’ structure) using the Geoscan Resistance Meter Susan spotted a cup-mark in a large granite boulder. Having drawn the object to our attention we had a closer look at the boulder, which appears to have been re-used at the site in the construction of a stone and turf bank. The finely pecked cup-mark was clear to see in the rough surface of the granite and peeling back a small area of moss at the base of the stone, Steven uncovered a second cup-mark. 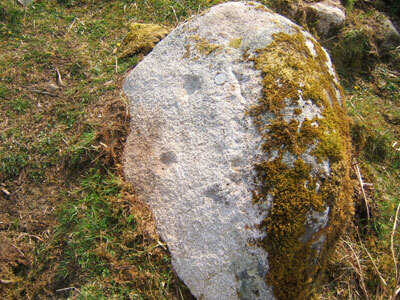 With the exception of a small group of Pictish Symbol stones in the area of Skye & Lochalsh, other forms of rock art such as cup-marked stones are quite rare. The nearest examples of note are in Glenelg, not far from the fine brochs within this secluded glen on the adjacent Mainland. And, although cup-marked stones have been identified in Iron Age structures such as souterrains, possibly as re-used pieces of rock art, it is thought that they may extend back into the Bronze Age and possibly into the Neolithic. Therefore, the discovery of the cup-marks at High Pasture’s potentially extends the use of the site back in time, a fact that may also be supported by the discovery of a microlith and a fragment of a leaf-shaped arrowhead.